We are one of the renowned Corporate Training providers in the area of Lean Six Sigma and Kaizen. Our trainers have clocked over 6000 hours of Corporate Training. Our versatile team provides the entire spectrum of training solutions across various industries like Manufacturing, Pharma, IT Services, Telecom, BPO and other Services. 1 Day Program on OEE & How to Improve it? CSense provides certification to participants who satisfy following criteria. We e adhere to these stringent requirements every time. Hence, our certification is highly respected and gaining a significant respect in the industry. With our structured questionnaire, we evaluate the program with respect to content’s relevance, session organisation and faculty’s delivery. Along with these outcomes, we apply statistical analyses to evaluate as well as to present the feedback graphically. We set a target score of 80% at each segment. The detailed feedback scores and graphical summary are shared with our clients and necessary learning is initiated. 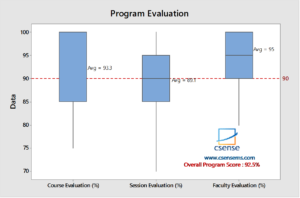 Click here to download CSense – List of Training Programs in pdf with more details.